It surprises many that at HealthWorks Chiropractic and Rehab we will often focus on the feet, when the problem seems located in the neck or lower back. Yet, your pelvis and feet are the foundation of your spine. Problems in one area can create compensatory problems in the other. That’s why we often recommend Foot Leveler Spinal Pelvic Stabilizers. First, we use a high-tech digital scanner to take a picture of your feet while you are standing in a normal, weight-bearing stance. This image records areas of stress on each foot. They are used to analyze your feet. 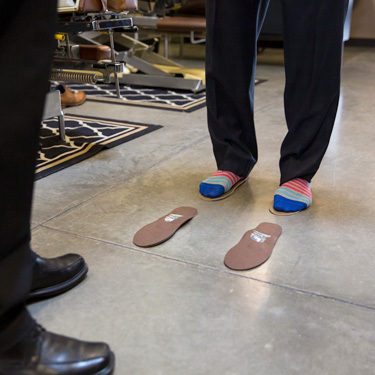 Up to 16 different data points are used to create a unique, one-of-a-kind shoe insert designed for your specific postural or structural challenge. These are custom shoe inserts that support all three arches in your feet. This creates a healthier, more attractive posture, plus a more stable foundation for your entire body. Though they may go unnoticed, these subtle imbalances can contribute to postural misalignments, knee pain, hip problems, head tilt, forward leaning head carriage and general fatigue. Best of all, not only do they work great, they feel great!